For Colorado weather, if you can count on one thing it’s that you’ll need heating. You may not need it at all this year, as we’ve lately been granted warmer winters and milder falls, but you’ll need it sometime down the road. So when your heater starts emitting death rattles instead of the proper heat into the house, what do you do? Panic? Invest in various rice packs and open the oven door to ward off the chilled air? It’s actually much easier than all of that, you just have to contact a heating replacement service. We can direct you over the phone in the different types of heating and how you can repair and replace your own heater, but if you can’t remember our verbal outline, we have it available in print as well. Check out our break down of the heating types and some of their pros and cons. In some areas, natural gas is probably the best heating option rather than electricity or oil. Natural gas heating often comes from a whole-home furnace that has a web of ducting around the room. You might find it in certain spaces and wall-mounted heaters or fireplaces, and while it often appears in older types of heaters, its natural, safe and actually clean. Generally, folks mostly use gas heating to warm up a stove or occasionally a dryer or grill in the backyard. It’s mostly outfitted in older homes as there are less expensive and equally safe ways to achieve the same result nowadays. Some folks call it hot water heating or radiator heating. 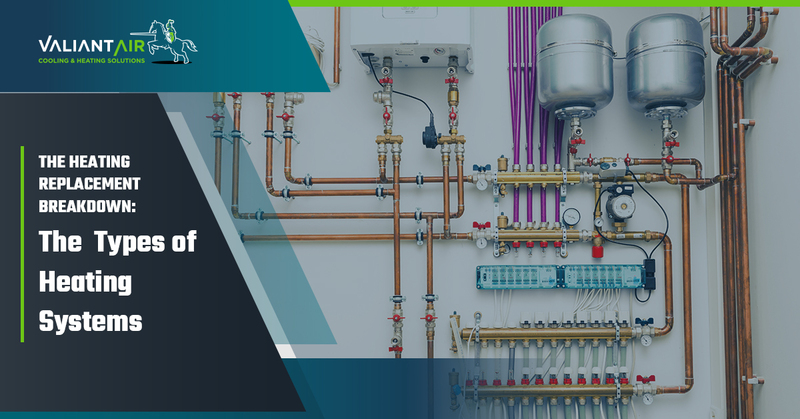 It generally involves a boiler system that’s hooked onto a network of hot water radiators in various rooms within the home. It’s much more cost efficient than other types of heating and is generally only installed when the home is under construction. Recently, this has become a pretty desirable form of heating, especially with the various leaps in technology that have allowed it to become one of the most efficient heating processes. While most people associate it with their outdoor grill or camping, it’s actually a pretty viable home heating solution as well. Like natural gas, it’s one of the most expensive forms of heating available on the market, not necessarily because of installation prices but because of the cost of propane itself. The various heating systems that run on this form of heating often come in the form of a fireplace or space heater. When purchasing a propane heating system, we encourage you to inquire if it can actually be used inside as propane has some unclear lines with certain heating appliances as to where it’s supposed to be used. The most common heating system is a multifunction unit that can both cool and heat the home. Generally, warmer climates benefit greatly from these systems as it saves them from investing in two different systems. Some of these nifty whole-home devices even come with dehumidification capabilities that really set them apart for folks that live in places like Florida and other humid areas around the East Coast. Reach out to us when you’re ready to repair or replace your heating system. We’re excited to hear from you.